Saturday, May 28th marked a personal milestone in my life. 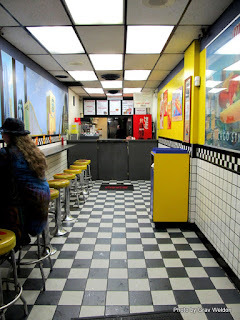 At 3:03 that rainy afternoon, a half block down Adams Street from Wabash, I had my very first Chicago dog. We’d been in Central Camera Company on Wabash, picking up ink and paper and goobing over photographic equipment and waiting for a camera charge. We had exhausted our abilities to hold off on purchasing way too much stuff and still needed a few minutes on that charge. The gentleman handling our order asked if I’d been indoctrinated into the joy of the Chicago dog, and when I mentioned I hadn’t had one yet he ordered us off to Max’s. “Get it double-charred, you won’t go wrong,” he told us as we huddled in the vestibule, waiting for the rain to ease up. We dashed the half block down to Adams and crossed the street, then skittered down to the aged green awning that bore the name “Max’s Take Out” in a sports script. Through the doors we looked down a long hall of white and black checkerboard tiles under a suspended ceiling, its mosaic’d walls only interrupted by one long bar to the left attended by yellow topped chrome bar stools and a couple of customers huddled over their purchased consumables. In the back, two gentlemen worked grill and fountain, hollering back a few comments at the seated customers. “What’ll ya want?” the larger of the two men behind the counter asked as we approached. 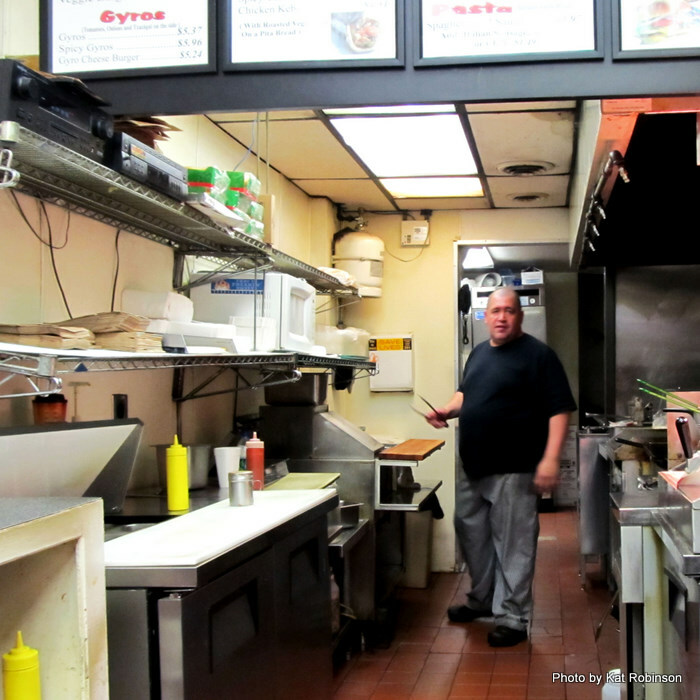 I scrutinized the menu, glazing over burgers and gyros, sandwiches and sausages and pasta offerings. The dog had been recommended. It was only for us to choose what we wanted. The hot dog itself was just $2.48, but we were just looking for a snack to share, so for two we decided to divide a jumbo for $3.16. “What’ll ya want onnid?” he asked as he threw a fat weiner on the griddle. My photographer and I talked about it. I was all about some tomatoes, but was concerned peppers might mess with me. 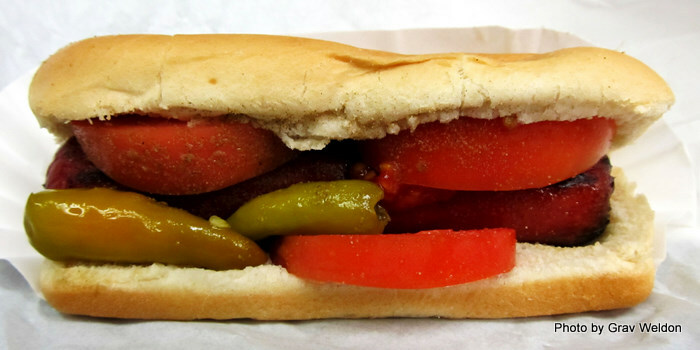 We agreed on a tomato, half pepper dog. Three minutes later we had our dog and our drink and were unwrapping the paper to shoot it. It was a pretty dog, traditional length but nicely plump, a deep red Vienna Beef dog that smelled incredible against the diesel-salt scent of the city and the pouring rain outside. The little sport peppers didn’t look so threatening, and for a moment I regretted not having them on my half. The dog was dusted with celery salt, which I had never had before on just about anything. That first bite -- the soft bread was pliant, the dog was meaty, the tomato was crisp… and I was stunned. 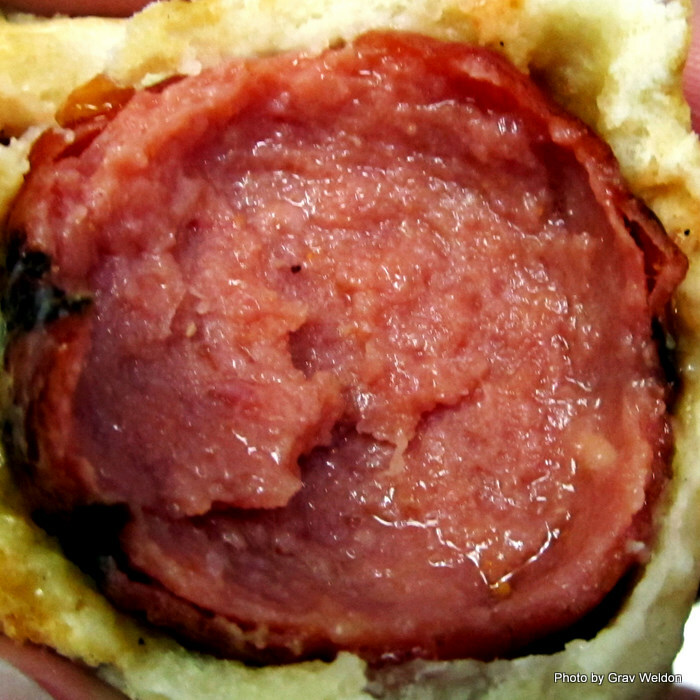 Anyone can make a hot dog in a bun. This dog was something else -- extra savory with a flavor I’d never encountered, a flavor that conjured baseball games and open-air events, meaty and filling and somehow elevated amongst its pedestrian origins. 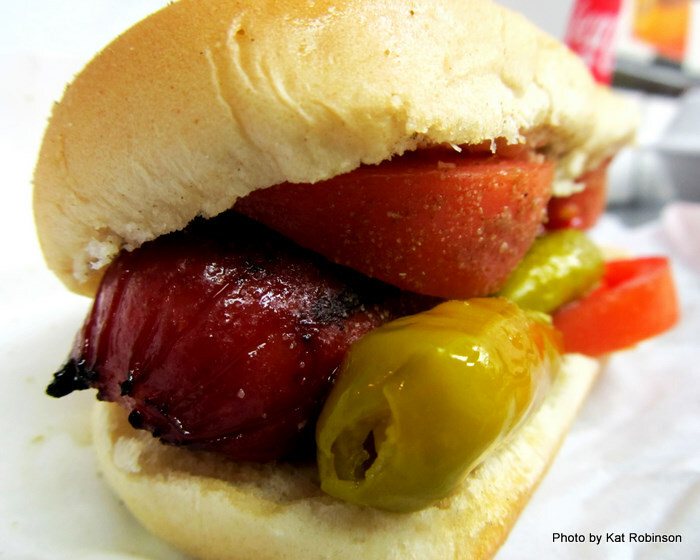 The celery salt gave it just the right exotic touch to pique my taste buds; I momentarily considered a second dog, just to get more of that flavor. It didn’t last long, just a minute, and we took a shot of that last bite to show the inside of this dog. I’d never had a Vienna Beef dog before, and until I got back to Little Rock I didn’t know you could get them south of the Mason Dixon line. I was almost sad that it was over so quickly, yet somehow so self-satisfied to have found such a strangely filling culinary experience on such a convoluted weather day. We might have spent ten minutes in Max’s, tops. Once the dog was gone we tossed the paper and walked out with the soda, headed back to pick up our purchases and camera battery. Two hours later, I was still questioning my decision not to get that second dog. It stayed with me, and had I not been introduced to Carm’s it’s not likely we’d have left Chicago without another stop on Adams Street. Max’s Take Out has a website here. You can order online or call them at (312) 553-0170. If you happen to stay at the Palmer House they’re literally just a two minute walk away. Give it a try.